Windows 10's Cortana digital assistant is pretty darn easy to use, but she becomes even more powerful with some tinkering. Cortana asking for permission to access your location. Click on any image in this article to enlarge it. But Cortana does a lot more than simply poke through your local documents. This virtual assistant lives up to its title: setting reminders, tracking your schedule, surfacing news she thinks will appeal to you, personally, and a whole lot more, powered by Bing and Microsoft's machine learning in the cloud. Cortana's no search slouch either, responding to your voice and understanding natural language commands like "Find my pictures from June." And if you try to get clever, Cortana isn't afraid to joke right back. Cortana's pretty easy to use in Windows 10 after a quick initial setup, but her bag of tricks runs deeper if you dive into the digital assistant's more advanced features. Here's everything you need to know about Windows 10's Cortana digital assistant, from basic training to tips and tricks, derived from the near-final Windows 10 preview build 10240. The first time you click the search area in the Windows 10 taskbar, Cortana will pop up and ask for a few basic permissions--voice and digital inking recognition, access to your location data, et cetera--as well as the name you'd like her to call you. Answer each as you see fit, though be warned: Cortana's at her best when you give Microsoft more of your information, much in the same way Google Now is most useful when you're tapping into Google's full range of services. The basic setup shouldn't even take a minute. After that, you can fine-tune Cortana's knowledge of you--or slap blinders over Microsoft's eyes--via Cortana's Notebook. Open Cortana, click the "hamburger" menu icon (three stacked horizontal lines) in the lefthand column, and select Notebook. From there, you'll see a slew of submenus. Inside About me you'll find options to change what Cortana calls you, as well as set specific "favorite" locations. When you create a new favorite location, you search for the address, then give it a nickname and optionally identify it as Home or Work. Afterward, Cortana associates that address with that nickname/identifier when you're asking for directions, setting reminders, etc. Connected accounts lets you tie Cortana into third-party services--currently just Office 365. Settings is where you control how Cortana behaves. Here, you can disable Cortana completely, enable/disable Bing Safe Search filtering, allow her to listen for you to say "Hey Cortana" to hop into action, decide whether to allow her to look for tracking information (for flights, packages, hotel reservations, etc.) in the other Microsoft services you use, and manage the data Cortana and Microsoft store about you in the cloud. Eat & drink lets you tweak whether Cortana pops cards with restaurant recommendations, complete with options for notification frequency, restaurant atmosphere, cuisine, price, travel distance, and more. Events has Cortana pop up suggestions for local events occurring nearby. Be sure to add event categories so Cortana knows what types of outings you're interested in! Finance tells Cortana to track specific stocks of your choosing. The crucial Getting around fine-tunes Cortana's traffic handling and reminders. By default, notifications for calendar events and traffic conditions around your favorite locations are enabled, but Cortana won't tell you when it's time to split for work (or home, from work) unless you opt into it. Movies & TV has Cortana pop up cards predicting the winners of big award shows, show times for local movie theaters, and trailers for new movies. You can choose whether you want to see each type of card. Music allows Cortana to toss up cards with music recommendations for popular music from the top of the Billboard charts. I already have Spotify for that, so I personally disable this entire category. News lets you tweak the news articles Cortana surfaces when you open her interface. The settings cover whether you want to see cards for local, headline, and popular news--but it's most important to manually add news topics and categories you want to track, to tell Cortana to surface information about those interests specifically. Something especially cool (and kind of creepy): Even if you don't manually fill those out, Cortana can intelligently learn your preferred news interests over time. Travel handles how you see details about planned trips, such as up-to-date flight status, notifications for the best time to head out to the airport, whether where you're heading, et cetera. Weather provides weather details and alerts for your home, cities of your choosing, or nearby your current location. Continue to the next page for more details on what Cortana is capable of doing, along with some fun tricks. Whew! Now that Cortana's tweaked and tuned, let's spend some time talking about what she's actually capable of in Windows 10. You can find a full list by asking Cortana "What can you do?" but here are the highlight features. One cool tidbit: Because Cortana's smarts are based in the cloud and tied to your Microsoft Account, all of your settings and reminders will carry over to other Windows 10 PCs, Windows Phone 8.1 devices, and (one day) Windows 10 Mobile phones that you log into. Microsoft will release standalone Cortana apps for Android and iOS soon, too. Most crucially, Cortana handles all search functions for the operating system--and she has a few tricks up her sleeve. First of all, Cortana doesn't only search your local files and system settings, but also the web, the Windows Store, and any files stored in the OneDrive cloud storage associated with your Microsoft Account. Finding your personal files about a topic takes a few extra clicks, however. Searching for something basic like "Windows 10" shows Bing search findings by default--even if you have a ton of pictures and documents about Windows 10. You'll need to click on the "My stuff" button at the bottom of Cortana's search suggestions--which unfortunately can't be set as a default--to scour your local files. Unless you take advantage of Cortana's awesome natural language search support, that is. Cortana groks commands you issue in natural language, so saying "Find pictures from June" or "Find documents about Windows 10" will immediately scan your files for matching results. You can even get fancy, mixing and matching modifiers with searches like "Find documents about Windows 10 from June." Cortana can also schedule reminders for you, tied not just to specific times but also specific locations (pulled from the Maps app) and contacts (pulled from the People app). When you tie a reminder to a location, it'll appear the next time you visit the place, while contact-based reminders kick in the next time you communicate with the person. You can set reminders two ways: By opening Cortana and clicking the light bulb "Reminder" icon in the left-hand pane, or by once again using natural language commands starting with "Remind me to..."
For example, you could say "Remind me to call Mom Friday at 5" or "Remind me to get my keys when I'm home" and Cortana will intelligently handle the dirty work, asking you to verify that the details are correct. If you say something like "Remind me to pick up eggs at the supermarket," Cortana will locate the nearest one and ask if that's the location you're asking about, allowing you to tweak it if not. Alas, Cortana doesn't handle people-based reminders very well with natural language. Saying "Remind me to tell Jennifer about eggs" results in a reminder with "Tell Jennifer about eggs" as the status, and nobody filled in as the contact. Need to wake up? Cortana can set proper alarms with commands like "Set an alarm for..." and "Wake me up in 30 minutes," too. The "at a glance" card interface when you open Cortana is really the digital assistant's bread and butter, beyond search and reminders. That's where the interest options you specified during setup will appear--news, stock info, restaurant reminders, etc.--as well as personal information you need to know, like flight statuses for your travel arrangements and meeting reminders. One issue: Cortana's card interface can become pretty crowded if you've selected several topics of interest, so you'll need to scroll down quite a bit to see everything. Fortunately, the assistant does a good job of placing more important personal information at the top. Cortana's also baked into Windows 10's new Edge browser. When you visit certain websites or search for certain topics, a small blue Cortana logo in the browser bar will pulsate, letting you know that Cortana has additional details. Select it and the assistant will pop in via a right-side pane, with supplemental information like travel distance to the location you're looking at, Yelp reviews, and photos of the place. Try it for yourself! Open Edge and browse to the website for Trattoria Cuoco, a Seattle area restaurant, to see an example. Sadly, there's no way to tell when a website will feature additional details from Cortana--visiting the websites for several popular New Hampshire restaurants proved fruitless. Cortana does a pretty mean Shazam impersonation. If you want to know the name of the tune that's playing right now, either say "Find song" or ask Cortana "What is this song?" She'll listen for a minute, then spit out the answer. Alternatively, Cortana can kick off your playlists by using commands like "Play music," "play all artists," "play all albums," et cetera, though only "play music" seems to work consistently right now. You can also tell Cortana to play the next track or the previous track, to pause or resume the jams, or shuffle the songs you're listening to. You can tell Cortana to "Open <program name>" and she will. "Show me the weather" will cause the weather forecast to appear in Cortana's interface. Cortana will also goof around with you if you're feeling playful. You can still coax Cortana into answering a wide range of fun prompts. PCWorld's " Ask Cortana anything" feature details a whopping 59 of them--and that's just the tip of the iceberg. Try these ones to start. Be sure to select the "Lets chat" rather than the "Search the web" option in the results to see her answers, and most of these have more than one answer if you ask repeatedly. Again, check out our "Ask Cortana Anything" feature for tons of additional playful easter eggs. Because Cortana's smarts are based in the cloud, the digital assistant is constantly evolving. Microsoft has a continued roadmap for her development after Windows 10's debut, particularly her Edge browser integrations. 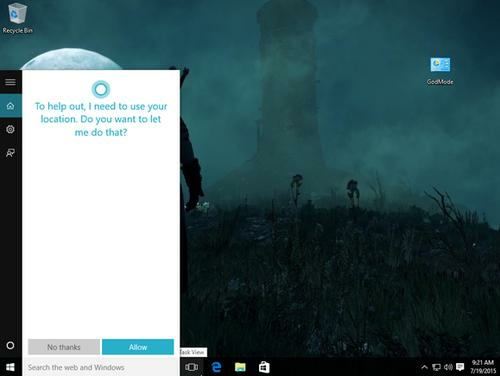 We have a few suggestions for ways Microsoft could make Cortana even more useful in Windows 10. We'd like to see an option to have Cortana search "My stuff" rather than the web by default for generic terms, and deliver more consistent supplemental results inside the Edge browser. It'd also be nice if you could opt for more in-your-face notifications for big personal events, and if Cortana did a better job of intelligently filtering the news, sports, etc., that you'd likely be interesting in seeing right now to the top of the at-a-glance card interface. Cortana can also theoretically be used to start email messages, using commands like "Send mom an email" or "Write an email to Jennifer." Indeed, entering commands like that causes Cortana to surface a "Send an email" prompt, but actually selecting it causes Cortana to pause for a second, then she simply searches the web for the term. All those gripes aside, Cortana's already proving to be a worthwhile addition to the Windows 10 ecosystem--a truly helpful, personalized assistant that carries over between all your devices. We can't wait to see where she goes from here. Wondering how else you can squeeze more from Microsoft's new operating system? Be sure to check out PCWorld's guides to the coolest new features you should check out first and the best Windows 10 tips, tweaks, and tricks.